Charles Louis Howley (born June 28, 1936) is a former American football linebacker who played in the National Football League (NFL) for 15 seasons, primarily with the Dallas Cowboys. Howley was a member of the Chicago Bears in his first two seasons and spent the remainder of his career with the Cowboys. He was named the MVP of Super Bowl V, and as of Super Bowl LIII is the only player on a losing team to receive the award. He was also the first non-quarterback to receive the award. Born and raised in Wheeling, West Virginia, Howley attended Warwood High School and graduated in 1954. He lettered in football, High school basketball, and baseball. In football, he was first team all-state and all-OVAC as a senior. As a teenager he competed in gymnastics. He played college football at West Virginia University in Morgantown, where he was a three-time All-Southern Conference selection and the conference player of the year in 1957. At WVU Howley joined the Mu Mu chapter of the Sigma Chi Fraternity. Howley played guard and center during his three years at varsity, in which the Mountaineers compiled a 21–8–1 record, including a 21–7 victory over Penn State, West Virginia's last until 1984. He played in the East-West Shrine Game and the Senior Bowl, which helped him get noticed by the Chicago Bears. He also was in the College All-Star Game in August 1958, a 35–19 win over the defending champion Detroit Lions. He is the only athlete in school history to letter in five sports: football, track, wrestling, gymnastics, and swimming. He won the Southern Conference one-meter diving championship. Howley was inducted into the West Virginia Sports Hall of Fame, the West Virginia University Athletics Hall of Fame, the Ohio Valley Athletic Conference Hall of Fame and the West Virginia University Academy of Distinguished Alumni. Howley was selected seventh overall in the 1958 NFL draft by the Chicago Bears, playing for two seasons before retiring after what appeared to be a career-ending knee injury he sustained in August 1959, at training camp in Rensselaer, Indiana. He played just three games late in that season and was inactive in 1960. When he decided to make a comeback in 1961 following a West Virginia alumni game, the Bears traded his rights to the Dallas Cowboys in exchange for second (#20-Steve Barnett) and ninth (#118-Monte Day) round draft choices in the 1963 NFL draft. Tom Landry, the head coach of the second-year Cowboys, made the gamble to acquire him, looking to perfect his 'Doomsday Defense'. The transaction paid off and Howley remained a phenomenal athlete, even after the knee injury. Perhaps his most noteworthy physical attribute was his speed. Landry once said that Howley might have made it in the NFL as a running back if he hadn't been too valuable to move from linebacker. Although he started in 1961 and 1962 as a strongside linebacker, in 1963 he embraced the switch to weakside linebacker, when it was decided that Dave Edwards had more upper-body strength. The move paid off as, at the conclusion of that season, Howley was named to The Sporting News All-East NFL team for the first time. Howley holds the record for the second most interceptions by a linebacker in a season with six, which he accomplished in 1968. Howley played with the Cowboys for 165 games over thirteen seasons, in two NFL championship games and two Super Bowls. The Cowboys finished in the top seven in the NFL in scoring defense and yards allowed in 10 of Howley’s 13 seasons with the team. 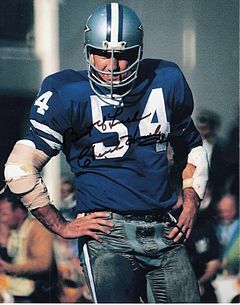 He was also named most valuable player of Super Bowl V, intercepting two passes and forcing a fumble in the Cowboys' 16-13 loss to the Colts, making him the first defensive player and non-quarterback to receive the honor. To date, he is also the only player from the losing team to win the award. The following season, Dallas made it back to Super Bowl VI, and again Howley had a great performance, recording a fumble recovery and a 41-yard interception in the Cowboys 24-3 win over the Miami Dolphins. His performance was under MVP-consideration, but quarterback Roger Staubach won the honor. During his career, Howley's athletic ability made him one of the greatest coverage linebackers of all time, intercepting 25 passes, returning them for 399 yards and two touchdowns. He finished with more than 100 yards in interception returns for both the 1968 and 1971 seasons. He also recovered 18 fumbles, returning them for 191 yards and one touchdown. He is second in Cowboys' history with his 17 fumbles recovered. His 97-yard return of a fumble during a game against the Atlanta Falcons on October 2, 1966 is still the second longest in Cowboys history. He also had a large number of tackles and quarterback sacks, but these statistics were not compiled until after Howley's career ended so his unofficial sack total is 26.5 according to the Dallas Cowboys with a career-high of 5½ sacks in 1965. Howley was named first-team All-Pro five times in his career, was a six-time Pro Bowler and was named to the All-Eastern Conference team in 1963. Following retirement, Howley ran a uniform rental business in Dallas and is now involved in a foundation dedicated to breeding quarterhorses at Happy Hollow—located in Wills Point, Texas. His broodmare herd consistes of more than 50 mares. He lives in Dallas. Howley is one of two living Super Bowl MVPs who did not attend the pregame ceremony at Super Bowl 50, the other was Bart Starr. ^ "West Virginia's Howley All-Southern '11' captain". Milwaukee Sentinel. Associated Press. November 30, 1957. p. 4, part 2. ^ "Midwest Dominates North Team". Retrieved February 19, 2016. ^ Johnson, Chuck (August 16, 1958). "Grid All-Stars slay inept Detroit Lions". Milwaukee Journal. p. 12. ^ "Ohio Valley Athletic Conference hall Of Fame". Retrieved February 19, 2016. ^ "Bears lose linebacker". Milwaukee Sentinel. UPI. August 12, 1959. p. 3, part 2. ^ a b "Cowboys sign Howley, ex-Bear". Milwaukee Sentinel. Associated Press. June 14, 1961. p. 2, part 2. ^ Mayer, Larry (April 25, 2013). "These Bears draft picks gained fame in other areas". Chicago Bears. Retrieved April 25, 2013. ^ "Mind-blowing stats for Week 5 of the 2013 NFL season". National Football League. October 2, 2013. Retrieved October 3, 2013. ^ "Dallas Dumps Dolphins". Retrieved February 19, 2016. ^ "Chuck Howley Retires From Pro Football". Retrieved February 19, 2016. ^ "Illegal blocking claim irks Dallas' Alworth". Victoria Advocate. Texas. December 13, 1972. p. 2B. ^ "Dallas playoff-bound without Howley". St. Petersburg Times. Associated Press. December 11, 1972. p. 4C. ^ "Injured Howley mum concerning retirement". Victoria Advocate. Texas. Associated Press. December 12, 1972. p. 1B. ^ "Dallas' Howley ends retirement". Wilmington Morning Star. North Carolina. UPI. September 19, 1973. p. 3C. ^ Admin, Site. "1. Chuck Howley". www.notinhalloffame.com. Retrieved April 11, 2019.